Note - This week is combined with a major IBU biathlon event and at times we may be restricted to some parts of the ski trails. This is a great week for those who wish to learn how to cross-country ski for the first time or for those who are looking at refining their technique, or wishing to transfer from roller skiing to snow for the first time. This course is also well suited for children as well who have done some roller skiing before, please send an email if you need more information about what we are able to offer for a family week. The week will start with the fundamentals of classic and skating. Each day the lessons will be broken down into small and simple steps which produce a greater level of progress in classic and skating. The program for the week will be structured to each person's needs, and what they would like to improve on. The morning lesson focuses on technical teaching, with emphasis on correcting faults, or working on the basics of learning to cross country ski, classic or skating. The afternoon lesson we tend ski away from the main teaching arena and out onto the trails, on the way working on one or two key elements as we ski, this produces faster learning progress, and gives you time to understand the methods that you have learnt in the morning. We tend to work on two days of classic or skating, then switch to which ever you wish to work on for the remainder of the week. In the evenings we have waxing talks, ski selection information and videos on training methods. Skiers are not expected to attend all sessions, and are free to explore the trails. 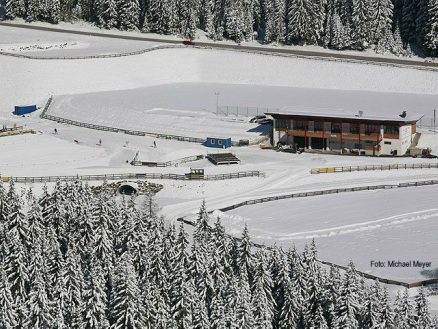 With Obertilliach so well situated, we can ski from the village each day, and make regular trips to the biathlon and cross country ski center which is only a short 1km run away. Obertilliach is a village in Austria's Osttirol, not far from the Italian border and 40 minutes from the popular skiing town of Dobbiaco. It has become a favourite training area for biathletes due to its snow record, and in recent years has developed some excellent tracks and a first rate shooting range, which has enabled it host IBU Cup biathlon races .Obertilliach is also renowned for its rustic charm, most of the houses are made from wood and there are some excellent cafes, hotels and an all-important bakery. The tracks are close to the accommodation and there is a wide range of skating and classic trails. Apart from the biathlon, Obertilliach hosts the classic version of the Dolomitenlauf ski marathon and is used by top cross-country skiers and biathletes for training. The local ski hire is able to offer top end 2019 / 2020 equipment for hire, and a great range of boots and skis for sale.